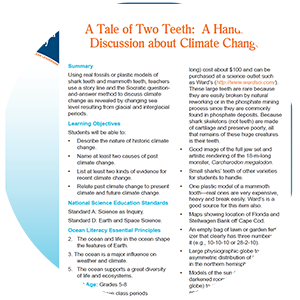 Actvity Summary: Using real fossils or plastic models of shark teeth and mammoth teeth, teachers use a story line and the Socratic question-and-answer method to discuss climate change as revealed by changing sea level resulting from glacial and interglacial periods. This lesson is a storytelling activity—a story that has characters (including a villain), a series of mysteries (starting with unexplained recovery of body parts) set in geologic time, clues to help solve the mysteries, a resolution, and finally, a sequel. You will ask your students to solve the final mystery (causes of climate change), but part of this mystery is still unresolved as it relates to future climate change and its effects on human society (the sequel). By actively engaging students in solving the mystery, they use thinking skills to assemble facts and observations to propose their own hypotheses or ideas. The key idea is to engage your students by keeping a fast-paced, rapid-fire question-answer-question-answer Socratic dialog going with short periods of explanation using hands-on materials and/or imagery that should then lead into another fast-paced question-answer dialog. Teachers are encouraged to call on students who appear reluctant to get into the fray by accepting any answer, however off point. Given an off-point answer, the teacher can bring the student closer to the point by providing clues and asking for elaboration. Teachers should be prepared to ask the same question from different viewpoints to get students back on track. The use of hands-on samples (rocks and fossils), compelling imagery, and other teaching tools such as maps and a physiographic globe are essential. This exercise cannot be taught effectively using PowerPoint as the primary medium—although some imagery can be projected at appropriate points depending upon where answers to the teacher’s questions have taken the group. To effectively teach this unit, some essentials of earth history and oceanography must be known by the instructor. This would include glaciations, sea-level changes, geologic time, ocean circulation, seasonality, food chains, extinction, and the basics of Earth orbital variations (Milankovitch-scale cyclicity).